FitWorkz 24 Hour Gym in DeKalb. FitWorkz members enjoy access to the largest 24 Hour gym in the area. FitWorkz also offers affordable access to personal, group and tream training. Training is focused on improving core strength, balance, flexibility and more all in a functional training environment. 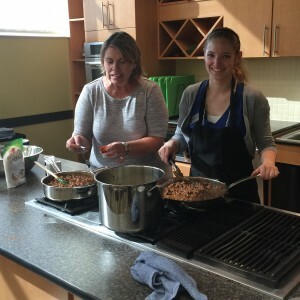 The group functional training Members also take advantage of Eat by Color Nutrition programming, nutrition plans and meal programs. We live in a time when we can watch TV and Movies on Demand, grocery stores and gas stations are always open, books and music are a click away. Today you can exercise any time you want at the largest 24 hour gym in DeKalb and Sycamore. Thank you for your patience. Our staff has been working hard to make this possible. The last of our systems testing is done. 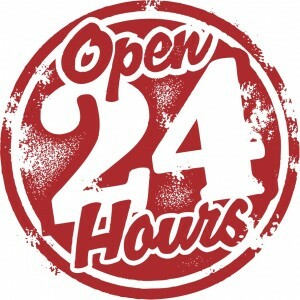 We are excited to finally be open 24 hours a day. The video below covers some of the key points for access to the club. We hope the increased access makes it easier for you to reach your health, wellness, and weightloss goals. Get Eat by Color Recipes Here. Dietician vs. Trainer Eat by Color Favorite Fall Recipes. 1) Canned Pumpkin add to shakes, yogurt, and many other things. 2) Kodiak Cakes, nothing beats warm breakfast and this is a higher protein one that tastes great. 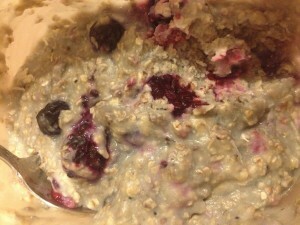 3) Oatmeal, again a warm meal option plus one you can make the night before or even the weekend before. 4) Squash many options with this seasonal vegetable. 5) Apples, portable, seasonal, pair with things like peanut butter for a great snack. 1) Quest Pumpkin Pie protein bar, portable and season. 2) Pumpkin seeds, portable, seasonal, bake in the oven and dust with garlic salt, parmesan, cinnamon, raunch, etc. 3) Sweet potato, season use a Veggetti and get creative. 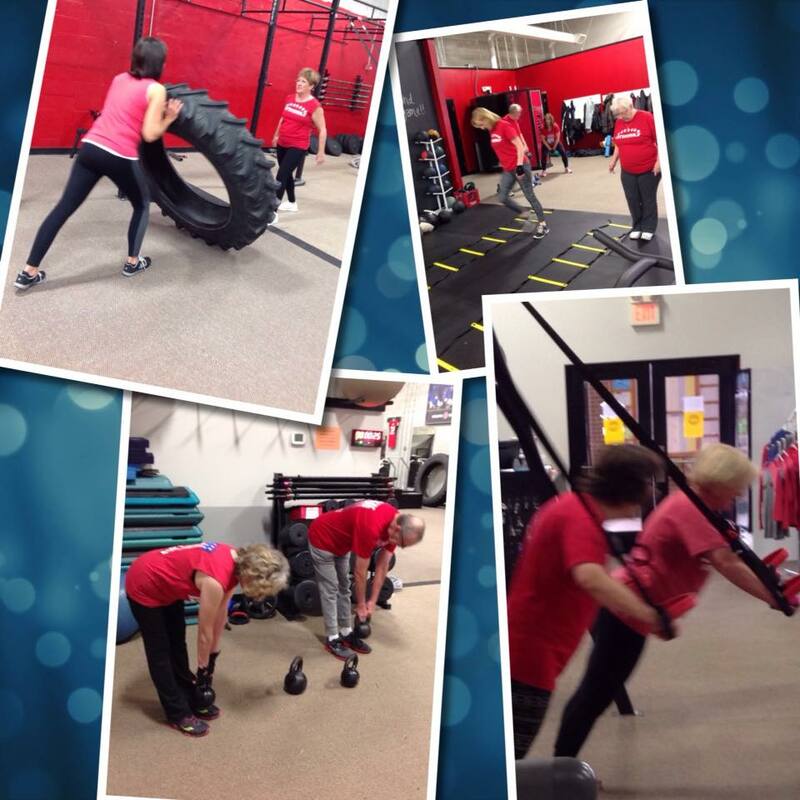 FitWorkz offers personal training to DeKalb and personal training to Sycamore. 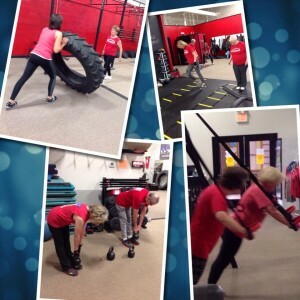 FitWorkz also provides large and small group training in DeKalb and Sycamore. Athletes age five to college complete speed and agility and sports performance training from Sycamore and DeKalb at FitWorkz. Eat by Color at FitWorkz teaches better food choices as easy as paint by number. 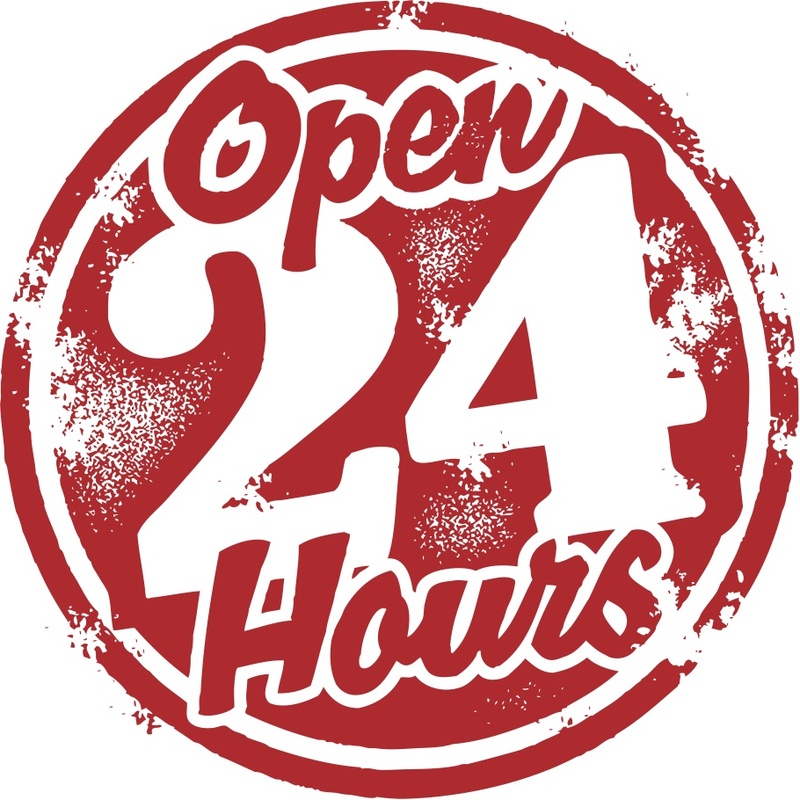 FitWorkz is open 24 hours a day 7 days a week. You can exercise and train 24-7 at the area’s largest health club, gym and fitness center. FitWorkz is not only the largest twenty four hour gym in DeKalb and Sycamore but it is the only functional training gym. Free weights, cardio, machines, kettlebells, bumper plates, TRX and more! 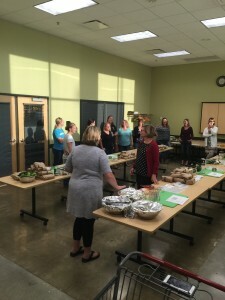 FitWorkz offers Eat by Color Nutrition counseling to DeKalb, Sycamore, Malta, Genoa and more. Eat by Color teaches simple easy to use methods to making better nutrition choices. Find out more today at EatbyColor.com. Ray Binkowski is the owner of FitWorkz a hybrid training gym in DeKalb, IL, author (all of his titles are on Amazon), and trainer. He has lost over 60 pounds and kept it off for over 15 years. He has worked with thousands including professional athletes, police/fire/military, physique competitors, even corporations like 3M, and most often people looking to make a long term change in health, wellness, and weightloss. Plus the Get Fit and Live Healthy podcast FREE on Itunes (just search Get Fit and Live Healthy on Itunes). On Amazon search for Eat by Color, Get Fit and Live Healthy, and Exercise Galore! 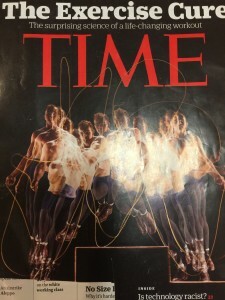 The New Science of Exercise was a recent article in Time magazine. The article looked at research on exercise and leads to the question. Is Exercise is Better than or equal to Medicine. It really can be. The trick is putting exercise to work for you in the healthiest way possible. This means picking the right exercise, in the right amount, and most importantly making sure it fits your schedule. The best plan will not work if it does not seamlessly fit your schedule and lifestyle. Exercise is Better than Medicine, here are some tips to put exercise to work for you. -10 hours a month. That is all you will really have for exercise. That is what we see members of our club, FitWorkz, having. The best part is if you spend your 10 hours a month doing the right things you can accomplish quite a bit. -You do not need another diet. You just need to make better food choices based on your likes and dislikes with food. Eat by Color does this in a way as simple as children’s paint by number. -Emphasize the weight training. Cardio is great but you have to do load bearing activity. This could be Pilates, Yoga, Free Weights, or Machines. But cardio only workouts will not get it done for you. -Cardio, try intervals. The best results in terms of health, wellness, and weightloss will come from interval cardio. -Be a kid again. Get active. Join a bowling league, fish, play co ed softball, or any other activity you used to do. For some reason after 18-22 years of age we stop playing games. Pick up the sport again. Many markets have leagues of like age people so get out there and get moving. The best part, you will never see the game as working out…even thought that is what you are doing. In support of these things. We had a 79 year old lady lose 4 dress sizes in 4 months exercising 45-60 minutes three times per week. How about a 20 something year old that went from exercising 10 hours a week and losing 4 lbs in six months to losing OVER 70 lbs in six months exercising ONLY 3 hours a week. Cholesterol, blood pressure, balance,… we can list members and clients that have improved just about everything with nothing more than a few hours a week of the right exercise. Get a Workout Here FREE! Ray Binkowski is the owner of FitWorkz a hybrid training gym in DeKalb, IL, author (all of his titles are available on Amazon), and trainer. He has lost over 60 pounds and kept it off for over 15 years. He has worked with thousands including professional athletes, police/fire/military, physique competitors, even corporations like 3M, and most often people looking to make a long term change in health, wellness, and weightloss. Plus the Get Fit and Live Healthy podcast. WHO Study Will You Get Cancer from Eating Meat? WHO study says you will get cancer from eating meat. WHO Study Says You will Get Cancer from Eating Meat. Is this even remotely true? Is their data right? Is there even data? Check the vid and find out! 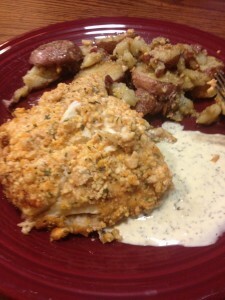 Unboring cashew crusted halibut looks gourmet and is easier to make that you think. This Eat by Color recipe is pretty simple. The hardest thing to locate for most will be fresh halibut. I got lucky as a local family has a son that is exported fresh fish from Alaska to the Midwest. I got a fair deal on fresh halibut. 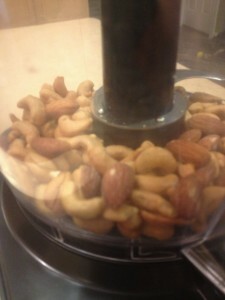 Run the cashews and almonds through the food processor. I used the pulse button and got carried away as I ended up with more a powder blend than a nice chunky mix. Live and learn I guess. Mix the panko, nuts, parmesan and spice in a bowl. Wash the halibut. Pour the panko nut mix onto a plate. Mine was a bout a 1/4 inch deep on the plate. Then press the fish onto the mix. Flip and do the same thing. Now there are some recipes that call for dipping the fix in eggs, milk, or some combo there of. The way I did it was lower on calories and fat. Since the panko nut mix stuck just fine to the fish I see no reason to do it any other way. I melted 1 TBS of butter in a cast iron oven safe pot. Heat the oven to 350. Place fish in cast iron pot and bake for 15-20 minutes. Since ovens vary you may need to bake longer or at a high temp. The fish will flake apart when done. Optional serve with roasted red potatoes and a white sauce. Description: Begin with cables set at shoulder height position. Hold a handle in each hand while facing away from the cable machine with a split stance. Step away from the machine so arms are straight out to sides with slight bend in elbow. Decrease distance between hands (like doing a bear hug). Slowly allow arms to return to starting position at sides. Every you need is in Exercise Galore. Weights, cardio, warm ups, core programs and more! Ray Binkowski is the owner of FitWorkz a hybrid training gym in DeKalb, IL, author, and trainer. He has lost over 60 pounds and kept it off for over 15 years. He has worked with thousands including professional athletes, police/fire/military, physique competitors, even corporations like 3M, and most often people looking to make a long term change in health, wellness, and weightloss. Plus the Get Fit and Live Healthy podcast. Follow us for daily exercise, motivation, and recipes! The Eat by Color Secret to Better Eating and Reaching Your Goals come down to having a a plan and being prepared. Our eating habits will determine our success or failure with health, wellness, and weightloss. If you have read Eat by Color or follow us on Instagram #EatbyColor or on faceobook you have seen us time and again say things like Nutrition is KING! Making better food choices, NOT dieting, like we teach with Eat by Color is the secret to long term success. A determining factor is planning and being prepared to eat right. Get Great Eat by Color Recipes Here! We shot this video during a DISH event at our local Hyvee in Sycamore Illinois. 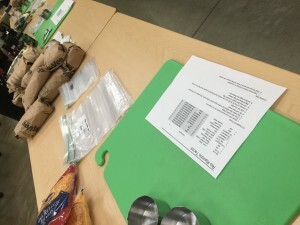 DISH allows a group of people to batch prep meals that are bagged and froze to be cooked later. What is really nice is Hyvee pulls all of the groceries and does the clean up. The group shows up preps the meals. 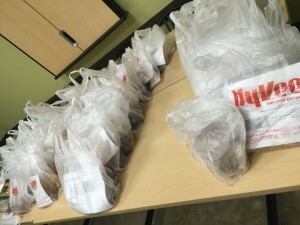 We prepped 72 meals (each feeds 4 adults) in less than an hour and a half. The best part… I handled the recipe selection and they are all Eat by Color friendly. Planning and preparing goes a long way to making life easy and being able to Eat by Color. 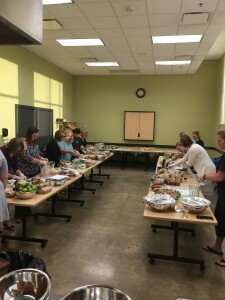 Get your own group together, if you are local join one of ours, or check out your local Hyvee! Unboring Effortless High Protein Oatmeal-Eat by Color Style that takes minutes to make. Most of us need an effortless breakfast option. Here is a high protein option that you the night before. It is also high in fiber and no one gets enough fiber as well as anti oxidants. 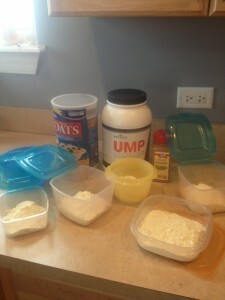 Put 2 scoops of UMP in a plastic bowl, add the oats, and then water until you have a thick almost past consistency. Mix in some berries. DONE! Place in the fridge. Overnight the berries will melt and the oats will absorb the water.